VATICAN CITY (CNS) — The two new Palestinian saints were instrumental in the promotion of women in the Arab world and in efforts for interreligious dialogue toward peace, said Jordanian Father Rifat Bader. 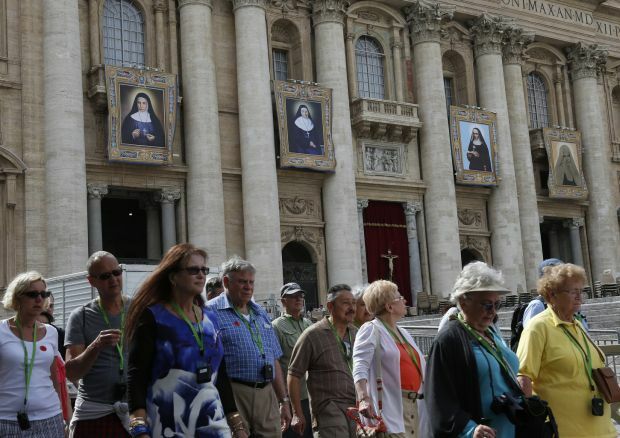 Pope Francis was to canonize Blessed Marie-Alphonsine and Blessed Mary of Jesus Crucified along with a French nun and an Italian nun by during a Mass in St. Peter’s Square May 17. Two days ahead of the Mass, larger-than-life-sized tapestries of each of the soon-to-be saints already decorated the facade of St. Peter’s Basilica. The four women are all 19th-century religious sisters. Among them is French Blessed Jeanne Emilie de Villeneuve, who founded the Congregation of the Sisters of the Immaculate Conception for the education of poor children, for the sick and for the missions. Italian Blessed Maria Cristina of the Immaculate Conception also founded an institute dedicated to education, called Congregation of the Sisters, Expiatory Victims of Jesus in the Blessed Sacrament. But it is Blessed Marie-Alphonsine, who founded the Dominican Sisters of the Holy Rosary of Jerusalem, and Blessed Mary of Jesus Crucified, a mystic and member of the Discalced Carmelites, who have captured most of the media attention. They are the modern first saints to hail from the territory that made up historic Palestine. “We view this grand event, which takes place for the first time since the days of the apostles, as a message of solidarity and encouragement to the Christians of the Holy Land, especially to the Christians and parishioners in all other Middle East countries, and to those who have been forcibly displaced and deported from their home countries, to all those who suffer from persecution,” Father Bader said during a May 15 news conference at the Vatican. The two Palestinian nuns were pushed further into the limelight four days before the canonization when the Vatican announced that the text of a formal agreement between the Holy See and the “State of Palestine” had been finalized. The agreement would recognize freedom of religion in the State of Palestine and outlines the rights and obligations of the Catholic Church, its agencies and its personnel in the territory. The completion of the text, which is awaiting final approval, was “just a coincidence” and not planned to coincide with the canonizations, Jesuit Father Federico Lombardi, Vatican spokesman, told journalists May 15, adding that the date of the canonization Mass was set in February, well ahead of developments in the agreement. The Palestinian aspect of the canonization was further highlighted by the announcement that Palestinian President Mahmoud Abbas would attend the Mass and that he would have a private meeting May 16 with Pope Francis. Israel was to be represented by its ambassador to the Holy See, Zion Evrony. Father Bader, director of the Catholic Center for Studies and Media in Amman, told journalists the church in the Middle East hopes that the two new Palestinian saints will encourage Christians in the region to “contribute more to society,” especially in the field of education. He said the church does not speak of Christians in the Middle East in terms of “a minority” because it is the qualitative presence of Christians that is important and not the numbers. “As the Holy Land, wrecked by violence and dissent, has for sometime had a tarnished image, our two saints emerge to restore its sanctity, reminding us that sanctity is possible even in the most difficult circumstances,” he said, according to Father Bader. Sharing his reflections on the Palestinian saints, Father Bader said the Carmelite Blessed Mary of Jesus Crucified was herself “subjected to acts of extremism and an attempt on her life” in an effort to “force her to change her religion” to Islam. Schools affiliated with her congregation continue to “have a prominent and influential presence in Jordan, Palestine, Lebanon, the Gulf states and Rome,” he said. In the late 19th and early 20th centuries, Blessed Marie-Alphonsine’s congregation “had a decisive role in the promotion of the Arab woman in the fields of culture, education and teaching” and to eliminating illiteracy in many parts of the Middle East, he said.